Summer vacations are best spent at the lake, and you won’t find a more ideal condo on Lake Coeur d’Alene than this charming hideaway providing boat slip rentals, a private marina, and even an indoor community pool for lucky groups of nine! Perfect for golf buddies or water skiers, the casual family-friendly space is your go-to headquarters for water sports, hiking, or mountain biking. The home is located in Arrow Point condos, a quiet complex directly on the lake which boasts a private marina, outdoor volleyball court, and heated pool. The communities of Harrison and Coeur d’Alene are within 20 miles when you’re in search of good food, family fun, and mountain culture! 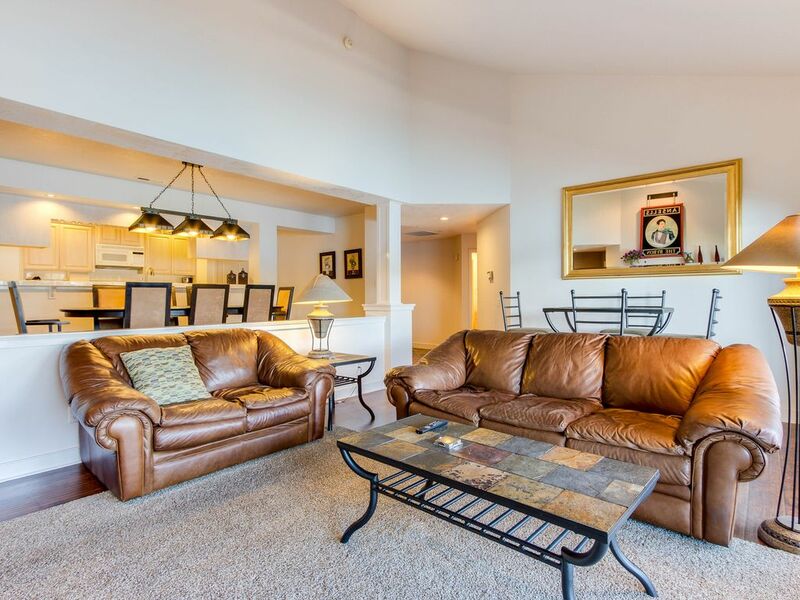 The well stocked condo is perfect for entertaining, offering a spacious living room and balcony overlooking the lake. Spend quality time outdoors playing cards around the balcony bistro table or cooking on the gas grill. When it's chilly, unwind inside around the cable TV. Paid WiFi (additional fee required) can keep you connected to work or loved ones back home, and the temperature will always stay just right thanks to a gas fireplace. At mealtime, your cozy home offers seating for the whole family and modern amenities in the kitchen for ease of meal prep (and even clean up with the dishwasher)! Your group of nine will feel instantly at home thanks to three full baths, three bedrooms, and laundry facilities. Choose from two suites, each with king beds, or a bunk room! Just outside your door, fish off the marina docks, play a game of pick up volleyball, or push off for long days on the water. Don’t have a watercraft? Rent one from Harrison Idaho Water Adventures! You're condo is secluded, yet a short car ride away from golf courses, ice cream parlors, cafes, bicycle rentals, and tasting rooms in Harrison. Make the trip into Coeur d’Alene for days at the spa, sushi bar, art gallery, or summertime festival. Family fun is just around the corner only 40 miles from home at Silverwood Theme Park where you can ride rollercoasters, rush down water slides, or watch firework displays! At the end of busy days, return home for a glass of wine on your balcony or quick dip in the community pool before the stars come out. Make Arrow Point your summer headquarters for family or friends! Parking Notes: Your assigned garage spaces are marked F-303. Should you have more than two cars, the third car must be parked outside the building in the open parking lot facing the volleyball court/pool house. Boat parking is available from Discovery Marina for $35 per day on "C" Dock. Dock Details: Boat parking is available from Discovery Marina for $35 per day on "C" Dock. Vacasa does not handle this. You must call Discovery Marina at 208-819-6876 to set this up. Great view, wonderful furniture decor and great floor plan. However, MUCH attention is needed to detail. Eleven (11) light bulbs were out, only one (1) washcloth in the entire 3 bath unit. 4 cupboards falling off hinges, Bath and kitchen towels were very old and ratty, baseboards throughout the entire unit were filthy and 'dust bunnies' everywhere on the wooden floors. Kitchenware looked like they were from a garage sale, mix matched, old and broken. We were very disappointed, especially for the price we paid! So sad, with some attention to detail, basic repair and cleanliness, this unit could be a AA+. Doubtful would rent it again without assurance of repairs. We are sorry to see you were somewhat disappointed in your accommodations. We will follow-up with housekeeping on properly cleaning and stocking the home for our guests. We hope to see you again! Beautiful Setting with gorgeous lake view!